It took Channel 4 and social media for Sarah Carey to discover that the Taoiseach made a great speech in the US. Why the censorship? I was busy last week. Like most people. I raced between domestics and school pick-ups and meetings. In the background, blipping into my consciousness, were snippets of the Taoiseach's visit to Washington. As my personality is split between romanticism and pragmatism, I knew what I wanted. Kenny had to go through with the formalities and make the best of it, no matter how vile we know Trump to be. But my romantic inclinations felt there had to be some opportunity to make a point, politely but with moral authority, that Trump's attitude towards immigrants of all nations - not just ours - was unacceptable. The Taoiseach had both an opportunity and obligation that could not be passed up. But all I picked up was the usual relentless sneering and criticism from Irish hacks. The scenes from the Oval Office were cringey and the promise of a visit from Trump nauseating. Across radio and print, my brief glimpses in my busy moments portrayed a craven Taoiseach kowtowing to a mad-man. Jokes to the vice president. Back-slapping with Paul Ryan. Even Steve Bannon, the sinister manipulator, donning a suit and lurking in the background. The most dangerous men in America all have Irish roots. Fantastic. I know we need these people to like us, but couldn't we have said something? So on Friday evening, after watching the Six One News on RTE, which included an insanely soft interview with Sean Spicer, I declared the whole visit to be a terrible disappointment. In fact, I was so annoyed I texted one of Kenny's advisers abusing him for the moral weakness of the whole thing. But that night I had a peek at the Twitter machine and saw something quite different. Apparently Channel 4 had broadcast part of a speech that Kenny made at the official White House reception with Trump standing right beside him. The comments on Twitter from non-Irish people induced a state which psychologist's call cognitive dissonance. Simon Schama, the famed British historian said: "Bravo to Enda Kenny. A reminder to the worthless scoundrel standing there beside him biting his gall." Another, Nick Offerman said: "Feel the room heave a sigh of relief as, at long last, a proper f***ing statesman holds the floor." Apparently the whole thing had gone viral. On the Channel 4 Facebook page, the clip had been viewed 21m times, with 12,000 comments. So I watched the speech. It was exactly what I'd wanted. In it, Kenny reminded Trump of Ireland's proud Irish-American history, in particular military history. That was smart. So too was his rhetorical trick of repeatedly using "great". He said: "St Patrick was, of course, an immigrant. And though he is, of course, the patron saint of Ireland, for many people around the globe he is also a symbol of, indeed the patron of, immigrants." The perfect segue - making sure that this was not just about the Irish - but about all immigrants. The Taoiseach went on: "Ireland came to America, because deprived of liberty, opportunity, safety and even food itself, we believed." (His emphasis) "Four decades before Lady Liberty lifted her lamp we were the wretched refuse on the teeming shore." That was great imagery: the perfect phrase to evoke what we've been helplessly witnessing. Trump had to see in his mind Aylan Kurdi, the boy found washed up on a Turkish beach. Kenny continued: "We believed in the shelter of America, in the compassion of America, in the opportunity of America. We came and became Americans." That's exactly what others, with no access to Trump, have been trying to tell him for the past year. These are the truly great things about America. Shelter. Compassion. Opportunity. Not aliens; but people who came and became Americans. Someone had to tell him, and Kenny did; with moral authority and confidence. With the reviled President standing right beside him. Despite all Trump's rantings and ravings, immigrants were the people who made America great in the first place. And Trump stood there and listened while our Taoiseach told him so. Channel 4 could see it. The New York Times could see it. Simon Schama and the tens of millions of people who viewed the speech could see it. 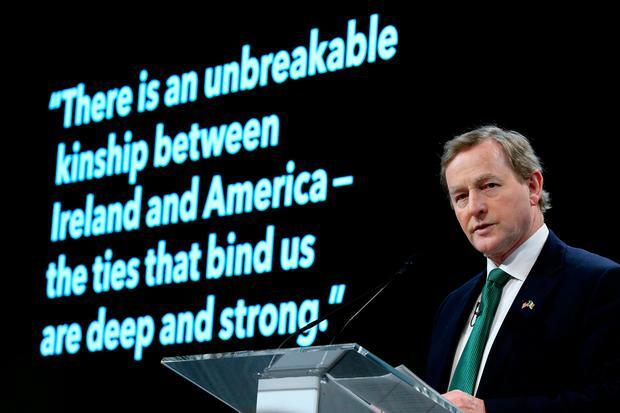 But the Irish media couldn't see it - because they wrote the narrative before Kenny set foot in America. "Craven, cringey, Taoiseach cosies up to Trump on last hurrah tour." Having failed to see the real news on Thursday night and Friday, they had to report how the speech was admired not by themselves, but by foreigners. When you cut out the news you don't want people to hear and replace it with what fits your pre-designed narrative; that's censorship. If not, what is? The result is that Kenny will go just as we face the oncoming storm of Brexit while we're left with a Pravda-like press who'll continue to manipulate the narrative shamelessly. Freedom of the press indeed.